Restaurants, events, shopping, movies, music, business, fashion, sports, school – it's all here at a bespoke-built new town of Camana Bay (www.camanabay.com) which is ever growing. The 200 hectares (500 acres) of this extraordinary project are beautifully-designed from scratch. The effect is of a high-end, safe small US town where everything is within walking distance. You won't believe you're in the Caribbean when you stroll along the Paseo. The master plan is a multi-decade, multi-million pound project by Dart Realty. The Bluff that runs along the centre of Cayman Brac is riddled with caves, many of them with tales to tell about the islanders who have sheltered there during hurricanes. One of the popular ones is Bat Cave, which for obvious reasons, is a photo opportunity in the making. Believe it or not, Grand Cayman is home to the original Batmobile – one of nearly 90 cars at the privately-owned Cayman Motor museum (www.caymanmotormuseum.com). There's also one of the first cars ever produced, an 1886 Mercedes-Benz. Well worth a visit. At this commercial turtle farm visitors can watch sea turtles at various stages of their development. There's also an artificial predator reef, a snorkelling lagoon, an aviary, a crocodile and a cultural centre. The farm has come under much fire for its high levels of government subsidy each year and there have also been doubts cast over the living conditions for the turtles. Ironically, even whilst you admire these noble, ancient creatures, you can do so from the Turtle Farm's own bar and restaurant – which serves turtle steaks, turtle burgers and turtle stew. Delve beneath the deep completely wetsuit-free with the Atlantis Submarine (www.atlantisadventures.com), which offers hour-long trips to view the spectacular reefs. The submarine is fully kitted out for tourists and is unsinkable, fully-pressurised and suitable for all ages. It's a great way to get under the water without the hassle, expense and restrictions of gaining your PADI dive qualification. Visit Booby Pond on Little Cayman, which hosts the world's largest colony of red-footed boobies. A natural, land-locked saltwater lagoon, it also has Magnificent Frigatebirds nesting around and was designated as a Wetland of International Significance in 1994. The visitor's centre is built in traditional Cayman style and is home to the National Trust. Over on the Brac, there's the Parrot Reserve which is home to the endangered Cayman Brac parrot. The Sister Islands are also home to the equally-endangered Rock Iguana. The deep waters surrounding Grand Cayman are prime fishing grounds, offering various species of large fish. The annual International Fishing Tournament (www.fishcayman.com) takes place in April. Go to Hell and back - literally. The peculiar rock formations of this area of Grand Cayman have evolved from shells and corals solidified by salt and lime deposits. A close examination reveals petrified forms of sea life that could be up to 20 million years old. There is a post office there which has one of the most unique local area stamps you will find. Look out for the devil himself – aka local shop owner, Ivan Farrington, replete in flame-red costume. Hike through the mangrove swamps and ancient forest along Grand Cayman's Mastic Trail (www.nationaltrust.org.ky), linking Frank Sound to Old Man Bay. The trail dates back to the 18th century and passes through a variety of flora and fauna. This protected area represents some of the last remaining examples of Caribbean subtropical forest. You may spot a native Cayman Green Parrot, Caribbean Dove, West Indian Woopdpecker, butterflies, lizards, frogs and more. Special tours are available and the trail takes approximately three hours. You will need to be reasonably fit to join this pedestrian route. This remarkable traditional Cayman home was the dwelling of one Gladwyn 'Miss Lassie' Bush, who began painting at age 62 after she had experienced a vision. Walls, windows, canvas are adorned with her intuitive art, which includes Biblical scenes as well as purely abstract patterns. The South Sound house is free to visit and tours of the wattle and daub house are available. In historic Bodden Town, which was Cayman's first capital, lies Mission House. It now serves as a museum portraying the history of the house, which was instrumental in bringing missionaries, teachers and more in the early years of the country. A historic – and beautiful - building in its own right, it is kept beautifully by the National Trust. Tours are available. Local, American and British art is on display at the National Gallery of the Cayman Islands (www.nationalgallery.org.ky) in George Town. Now situated in an impressive multimillion pound new building, the gallery also puts on numerous events, openings, films, lectures and more. Learn the history of the islands in The Cayman Islands National Museum (www.museum.ky), George Town, where there are interactive exhibits and a good shop. The museum itself is a listed building which has over the years been used as a government house, prison and schoolhouse. This early 19th century plantation great house (www.pedrostjames.ky) and is set in beautiful grounds by the sea in Savannah. The oldest building in the Cayman Islands, it was the site of the 1831 proclamation ending slavery in the islands. It is also the 'birthplace of democracy' where the first governments sat. Pedro St. James is very popular for weddings and special events, including live music. Cayman's offshore reefs and walls - including Little Cayman's Bloody Bay Wall - are world renowned for diving (www.divecayman.ky). Various locations also offer wreck diving, particularly Cayman Brac, where a Russian warship was intentionally sunk in the late 1990s. At the top end of Seven Mile Beach/North West Point lies the Kittiwake, an extraordinary 77m- (251ft-) vessel deliberately sunk in 2011 to serve as a dive site and artificial reef. The site is run by the Cayman Islands Tourism Association. It's both diver- and snorkeller-friendly, with excellent dive-throughs of the hyperbaric chambers, muster decks, crew quarters and a sense of grandeur. Ironically, the Kittwake originally served as a submarine rescue vessel. 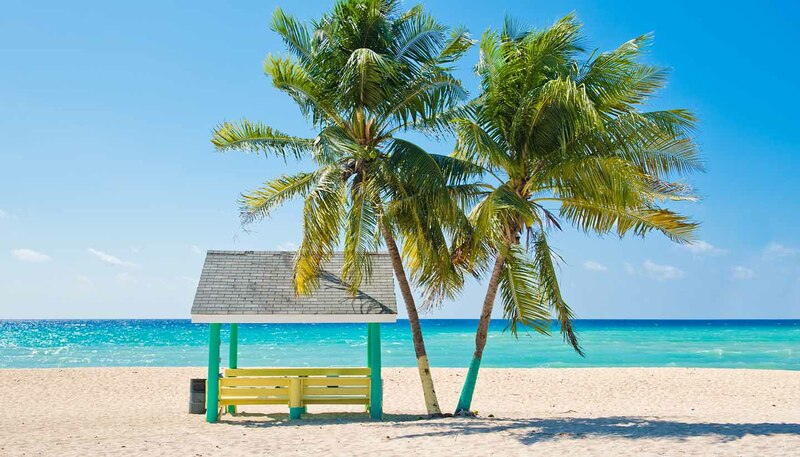 The turquoise waters of Grand Cayman's West Bay are backed by the long, sandy Seven Mile Beach, and, while this is the main tourist centre and highly developed, this glorious stretch of coast retains its idyllic charms. As with all beaches in the Cayman Islands, the land up to the high water mark is public. Beware, therefore, of bars or restaurants asking for fees to use their beach. Hiring their loungers, yes. Paying for public beach? No deal. Snorkelling is wonderful in the stretch outside the Marriott hotel. Snorkel alongside southern stingrays at Stingray City in North Sound on Grand Cayman. These shallow waters are home to a profusion of stingrays and visitors can get right up close with these otherworldly, gentle creatures. As the story goes, when fishermen of yore cleaned their catch, they'd throw the unwanted innards overboard. Over a number of years, the stingrays came to associate the noise of the returning boats with a free feed and as a consequence both Deep Stingray City (near the reef) and the Sandbar have become popular sites for tourists. The stingrays aren't tame but are very used to visitors. They do have a barb which can sting if they are scared or provoked. Be aware that lifting them out of the water is considered cruel; stroke them gently along their fins and you'll get on just fine. They don't bite, but might leave you with a hard-to-explain hickey if you get too close. It is possible to feed them by hand. Need to polish up your board skills before hitting the beach? Learn to surf in a wave tank at Black Pearl Skate and Surf (www.blackpearl.ky), in Grand Harbour. Waves aren't going to be six-footers in Cayman because of the reef, but there are plenty of spots in the right weather. Wander around the Queen Elizabeth II Botanic Park (www.botanic-park.ky), a 26-hectare (65-acre) heritage garden boasting a vivid array of cacti, shrubs and native flowers. The park has become the focus of a highly successful conservation programme to protect the endangered Cayman blue iguana which is constantly threatened both by new development leading to habitat loss and the invasive, non-indigenous, bigger, brasher green iguana.